Last day of the week for Faith and I decided, to ward off the temptation of buying fast food when I went to pick her up, I'd make sure to send her a lunch. She is the easier of the two kids (as in she eats everything I send her), so I poked in the freezer and fridge for a quick & easy lunch. She had a chicken & veggie stuffed muffin, carrot sticks with ranch dip (note to self: out of most veggies), canteloupe & pineapple (and a lone grape), and some animal crackers. Easy, quick and all eaten! I like seeing your posts for food ideas (although we're kind of limited by allergies in our family). Those chicken veggie stuffed muffins sound yummy! I'm leaving an "award" for you on my blog tonight. Love your bento. Does she eat the muffin cold or do they heat it at school? We need cold lunch ides! Thanks. And by the way, we lived in Dallas for four years-- our boys were born there. We'd loved it. 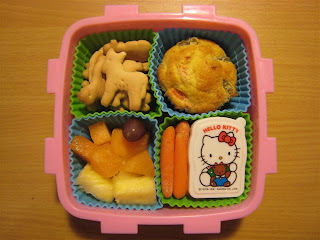 Your bento boxes are so cute! I found an interesting website that shows what Taiwanese people would pack in their lunch bento boxes. Sorry, it's in Chinese, but the photos are very yummy looking. wow chicken and veggie stuffed muffin. I know this is an old post but I think this is something my kid my eat. She hardly wnats to eat any protein or meats. Please if you have a recipe let me know! But in lieu of the taco beef & cheese, diced a couple of cups of cooked chicken breast (great way to use out leftover chicken) and maybe a cup or two of frozen mixed veggies. You can mix & match the fillers however you like, just make sure there is lots of it or the muffin doesn't tend to be flavorful enough.